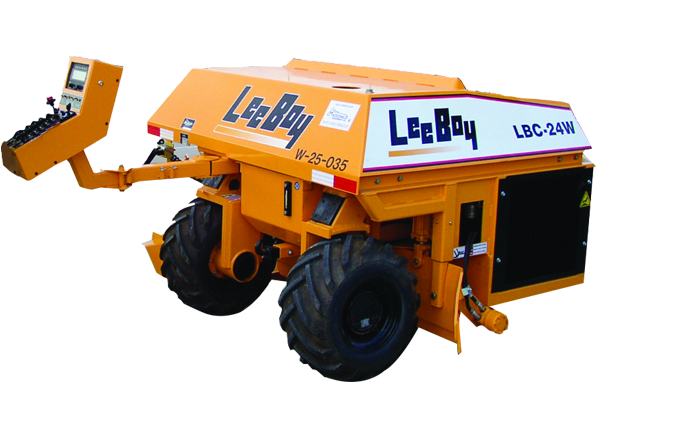 The LeeBoy LBC-24W Concrete Curb and Gutter machine is a maneuverable, compact machine that enhances job-site productivity, speed and quality. The LBC-24W is designed to cost-effectively slipform curbs and gutters, alley ribbons and narrow sidewalks. Steering controls turn a smooth radius as tight as 24 inches elminating time-consuming hand forming. The LBC-24W features a powerful 44-HP turbo diesel engine, hydrostatic variable speed drive, superior visibility and electronic controls, enabling a one person operation. Its compact size (7,500 pounds), all-wheel drive and maneuverability make for simpleset up and transport. The LBC-24W can be used on soil or pavement using a stringline or manual controls. Pouring molds can be replaced quickly and easily with the quick-change mold system.